The Great White North is currently enjoying one of its best Winter Games ever, but the winning ingredient may not be money, fame, celebrity or even patriotic support. It’s guts. This year, I thought, my lifelong love of the Olympics, was, if not at an end, under serious challenge. PyeongChang? The site of the Games conjured up no vision at all. Nor, with newspapers and other media so reduced, was there any real build-up to these Winter Olympics to whet the appetite. Once Gary Kingston, the Vancouver Sun’s consummate chronicler of BC’s winter athletes, departed, coverage dropped to virtually zero. As for the Globe and Mail, my former paper has regularly sent a healthy contingent to the Olympics, including, on occasion, me. This year, the Globe opted for a small force of three. The late, dispiriting, get-out-of-jail-free card delivered to Russia’s organized dopers didn’t help. Given that, the lack of buzz and an awkward time difference of 17 hours, I was wondering how much of the Games I would watch at all. I should have known better. Wednesday afternoon, more than a day before the lavish Opening Ceremonies even took place, where was I? Watching the Olympics: Mixed doubles curling. Although Canada eventually lost this strange, albeit fun hybrid of the roaring game to Norway, I was already back inside the tent, hooked once more. As always, bold predictions for our Canadian athletes are trotted out before the Games begin. Inevitably, there are disappointments. Nothing in sports is quite like the pressure of the Olympics. With the proverbial whole world watching and the added burden of carrying the hopes of your country, which resolutely ignores you the rest of the time, a competitor gets one chance every four years to come through. There is no wait ‘til next year. No wonder pressure claims so many victims, while relative unknowns, with nothing to lose, often emerge as surprise gold medalists. That’s why the drama of the Olympics is unsurpassed, and that’s why Canada’s first five medals at these Games – four silvers and a bronze — were so inspiring. Mark McMorris, Max Parrot, Ted-Jan Bloemen, Justine Dufour-Lapointe and Laurie Blouin: with everything on the line, all won their medals with truly courageous performances. In men’s slopestyle, the fact Mark McMorris was even at PyeongChang was one of the major stories heading into the Games. At Sochi in 2014, the legendary king of “big air” from flatland Saskatchewan had gutted out a miraculous bronze medal, despite fracturing a rib just two weeks earlier. In 2016, he was sidelined with a broken right femur. And then, a mere 11 months ago, snowboarding with some pals in Whistler’s backcountry, he slammed into a tree and nearly died. His injuries read like a doctor’s meat chart: broken jaw, broken arm, ruptured spleen, fractured pelvis, more rib fractures and a collapsed lung. 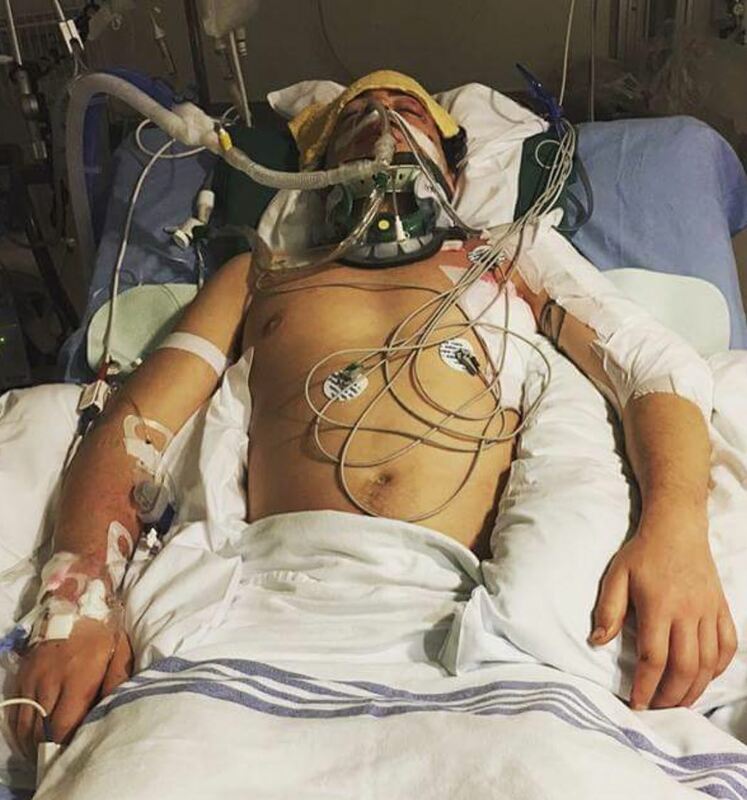 The picture of McMorris in hospital, with bandages and a zillion hook-ups all over his battered body had gone viral. We Can Rebuild Him: Mark McMorris earned the nickname Bionic Man the hard, hard, hard way. Once out of hospital, McMorris undertook a rehab program so arduous as to be absurd. Defying predictions he might never snowboard competitively again, he was back at in late November. But how would he do at the Olympics, where pressure and competition are at their most intense? If there was any fragility left from his astounding crackup, now is when it would show. No worries. Mark McMorris came through with high-flying colours. His soaring stunts brought him so close to a storybook gold, he was almost disappointed at winning bronze, against odds no one but McMorris thought beatable that dark, terrifying day in Whistler. Two Olympics, two miracle podium finishes for Canada’s Bionic Man. Courage. Slopestyle team-mate Max Parrot, whom many ranked ahead of McMorris, succumbed to the swirling winds, falling heavily on his first run, and then again on his second run. As he awaited a third and final attempt, Red Gerard, the 17-year old American kid, was on top, McMorris second. Parrot was nowhere. The last snowboarder in the competition, this was it. There was no margin for error. The next Olympics were four years distant. He looked out over the snow-swept terrain, the series of tricky rails and tall, launchpad jumps and the crowd far below. “I had a lot of pressure and my heart was beating really fast before starting on the course,” he recounted, later. It was all or nothing. And the 23-year old Quebecer nailed it. The second highest score among all contenders and a silver medal. As for those two falls: “I hit my head twice, pretty hard actually. My helmet made it possible for me to survive. I’m really happy.” Courage. It happened to Ted-Jan Bloemen. The Dutchman-turned-Canadian was a pre-race favourite, but these were the Olympics, his first. After building a quick early lead over his Norwegian track partner, he began to struggle. With just a few laps to go, Bloemen had fallen behind. He seemed done. Yet somehow, from somewhere, he summoned an inner reserve of strength and began fighting back. When the two skaters crossed the finish line, his skate blade flashed across the line a miniscule, two one-thousandths of a second ahead. It brought him the silver medal, the first by a Canadian at that distance since the 1930’s. The Norwegian, Sverre Lunde Pedersen, was stunned. “I thought he was tired, too tired to skate fast at the end, but he came back,” he told reporters, afterwards. “That was impressive.” Bloemen’s time was his fastest ever at that altitude. “I got everything out of myself that I had.” Courage. 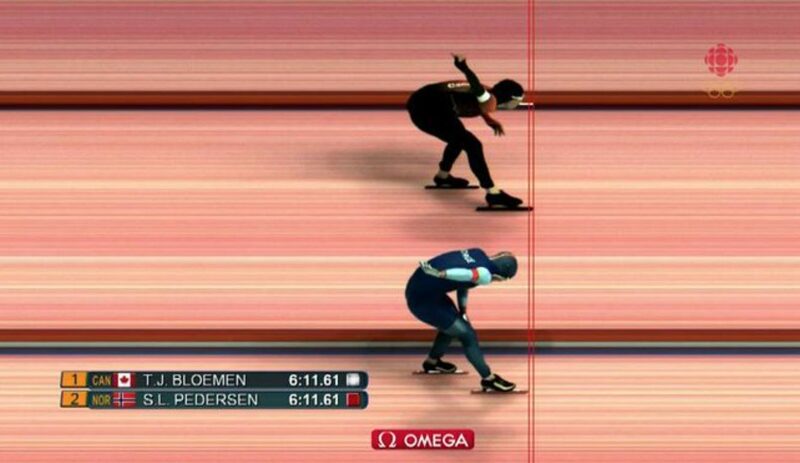 Speediest Skater: Ted-Jan Bloemen’s photo finish could not have been closer. Four years ago, “les soeurs extraordinares”, as I called them, captivated the country at the Sochi Winter Olympics. Justine Dufour-Lapointe hurtled down the treacherous mogul course to a gold medal. Beside her on the podium, with a silver medal around her neck, was none other than her sister Chloe. Justine was 19, Chloe 22. It was perhaps the story of the Games, and I blogged excitedly about it here. For many Canadians, their first glimpse of this year’s Winter Olympics was a long-range shot of a large red sled transporting Canadian snowboarder Laurie Blouin off the course, after she crashed hard during training on the Games’ first day. Taken to hospital, she was soon released, but Canadian officials were mum about her injuries. It was left to Mark McMorris to reveal: “She whacked her noggin pretty good and cut up her face.” Yet Blouin somehow made it to Monday’s final, which was clouded by controversy. Fierce, gusting winds buffeted the snowboarders as they soared high into the sky, causing fall after fall, including Blouin on her first high-flying venture. But the event continued. Having already fallen once, with memories of her crash still fresh, would Blouin’s psyche be strong enough to brave more danger from the ferocious gales, described as “terrifying” by another Canadian slopestyler? You bet. A backside 720, a frontside 540, a solid landing from a cab underflip, and Laurie Blouin had a silver medal, just three days after her release from hospital. “I’m really stubborn,” the young Quebecer, displaying a sinister welt and prominent cut under her left eye, asserted to English-language reporters. “Is that how you say it?” Yes it is. Courage. For more Mickelburgh, check out the Ex-Press archive or visit Mickleblog. Top Photo: Justine Dufour-Lapointe, Canadian mogul champion and Olympic medalist. No Replies to "How do you spell Canada? C.O.U.R.A.G.E."